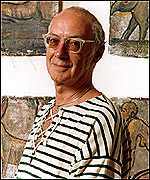 Roger McGough, 'a trickster you can trust', is one of Britain's best-known poetry voices. IT'S a word used by everyone in search of a bacon pick-me-up in the morning, but it got Liverpool's Capital of Culture triumph banned from the House of Commons order paper. Po-faced officials yesterday stamped on attempts to table a Parliamentary motion congratulating the city on its 2008 success because of one word - sarnie. The Westminster authorities ruled the word to be slang and therefore out of order, fearing it would offend Michael Martin, the straight-laced Commons Speaker. If only the MP trying to table the motion had been carrying the hallowed Oxford Dictionary, which features the offending word on page 1224. That means it can be used in Scrabble. Furthermore, the Daily Post's research revealed sarnie to have been a feature of the ever-evolving English language since the 1960s, long before the Speaker entered Westminster. The ban squashed an attempt by the Liverpool Culture Company to claim a place in history with the first ever Early Day Motion (EDM) in rhyming couplets. City poet Roger McGough penned the 14-line tribute, which noted: "The city has something to celebrate. European Capital of Culture, two thousand and eight." The motion had been written in preparation for yesterday's reception on the Commons terrace, overlooking the River Thames, to update MPs and other guests on progress as 2008 nears. When it failed to appear on yesterday's order paper for MPs, rumours swept the event that it had fallen foul of a ban on poetry, with motions allowed only in prose. But Labour MP George Howarth told the gathering: "There is nothing in the rules to say you can't have an EDM in rhyming couplets and the clerk was ready to accept it. "But Roger had the ingenious idea of rhyming 'Armani' with 'sarnie' - and that was sufficient grounds for him to reject it." A Commons spokesman said the Table Office, which took the decision to ban the EDM, was not prepared to comment. Mr McGough, who got his revenge by reading out the EDM via a video link, said he was not surprised by the decision because poems "always seem to get you into trouble". He added: "This verse was a celebration of Liverpool and so I wrote it in a way that celebrates Liverpool, including the language we use here and the humour. "It may be that the authorities thought it was somehow cheeky, but it wasn't. It was a genuine expression of delight. It is a shame it has not been accepted." Star of the show at the reception was Nancy Dell'Olio, girlfriend of England football coach Sven Goran Eriksson, who said she was bowled over by the fantastic atmosphere at Anfield on her recent visit. She added: "I first heard of Liverpool when I heard of the Beatles. Their names were the first I learned after mummy and daddy." Ms Dell'Olio was thrown by a challenge to interpret Scouse terrace phrases such as 'He has both legs in one knicker' (He isn't playing well) and 'When Jesus was playing full-back for Israel' (A long time ago). But she won cheers for translating into Italian 'Everton have won the Championship' - a phrase, everyone agreed, not often heard in either language. THAT this House congratulates the people of Liverpool For scousers, as you all know Aren't given to boasting or making a show Stiff upper lip, that's our motto When we speak it's voce sotto But the city has something to celebrate European Capital of Culture, two thousand and eight. So it's off with the trackies and on with the Armanis Out with the champagne and the caviar sarnies The chance to invest in what it does best, Dance, drama, music and the rest. 'The Town of the Talk', more sinned against than sinning If not a new Jerusalem, at least a new beginning. That this House shares the sense of pride, Of purpose and spirit, on Merseyside. I think the poem is great. European Capital of Culture, two thousand and eight. Dance, drama, music and the rest. If not a new Jerusalem, at least a new beginning. That this House shares the sense of pride, Of purpose and spirit, on Merseyside. This is this mans art, how dare it be dismissed like that, I hate the pretension of it all. In fact I am insulted it was shunned like that! Last edited by victorialush; 03-29-2006 at 09:09 PM. The man who put Liverpool poetry on the map is being honoured by the University of Liverpool on Monday (today). 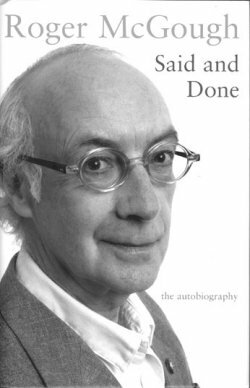 Roger McGough, who was also a member of 60s pop group The Scaffold, will receive a honorary degree. A regular presenter of BBC Radio Four's Poetry Please he was one of a group of Merseyside poets who made verse accessible to people. Another poet from the era, Brian Patten, who was in The Mersey Sound anthology, is also being honoured. Terry Hands and Martin Jenkins who founded the ground breaking Everyman Theatre in an old Methodist chapel in 1964 are also being honoured by the university during the week. Actors Pete Postlethwaite and Alison Steadman will receive honorary degrees as part of the city's "Year of Performance". Among other people whose achievements are being recognised by the university are Mohammad Akbar Ali, a leading figure in the city's Muslim community and Birkenhead MP Frank Field. Mohammad Akbar Ali, who played a pivotal role in the campaign for the release of Ken Bigley from captivity in Iraq, is honoured for his contribution to developing cultural and inter-faith relationships in Liverpool and Mr Field will be awarded a doctorate for his work in social and pension reform. The Mersey Sound was the biggest selling book of poetry anywhere in the World and the Liverpool poets deserve this honour for spreading Liverpool culture around the globe. I picked up a copy of Roger McGough's autobiography Said and Done while I was in the UK a couple of weeks ago. I highly recommend it as an entertaining memoir by one of the cleverest and wittiest minds around. "Roger McGough... is doing alright. Both a CBE and OBE are safely tucked away in his sock drawer and his hypnotically attractive tones entrance a trillion fans over the airwaves via Radio 4’s incredibly popular Poetry Please. It comes as no surprise to learn that the one most amazed by all this is McGough himself – and no one is more deserving of this level of recognition and applause than this self effacing man of words. As a Liverpudlian, he could not have been better positioned to benefit from the social changes of the 1960s and the Mersey Beat was seized by McGough (and friends Brian Patten and Adrian Henri) to transmute into the rhythm of the Liverpool Poets (Mersey Sound: Penguin Modern Poets 10. 1967). Although McGough and friends had fun with spoof, anarchic ‘pop group’ The Scaffold in the first half of the 60s – which incredibly had Top 10 hits with limerick-like ditties such as Lily the Pink – he has put in over 40 years at the coal face of poetry with an impressive list of publications. There are certain areas of the North that are breeding grounds for a laconic, droll humour informed by an acute sense of life’s bitter ironies. Newcastle is one, Liverpool another. McGough’s genius is to synthesise this into an art form that loses none of its punch but simultaneously avoids viciousness and rancour. McGough’s immense talents polarise with ease: he produces witty writings for children on this hand, and provocative and knowing verse for adults on that hand – and provocative and knowing verse for children on the other. It would be a grave error indeed to mistake the lightness of touch and innate humour for lack of depth and intellect. So here, finally, is the author by the author, no chance of a ghost-writer in this tome, unless it is R. McGough. As might be imagined, all is related with typical humility and self effacement as the cultural icons of the century slide by: Jimi Hendrix, Bob Dylan, The Beatles... and he is not averse to a bit of introspection when the moment demands it (page 2, line 16). But the voice is pure and his own and it imbues this autobiography with a certain authenticity which only exists when the subject is also the professional scribe. It is rumoured that McGough is now almost 70. He has become a .org; and like a good bottle of wine he has evaporated with age and is a slim, elfin like figure recognised and appreciated the length and breadth of Britain. It couldn’t happen to a nicer man – and probably the next Poet Laureate..."
I really enjoyed this book too. I just wish I had his way with words. Terrific! !